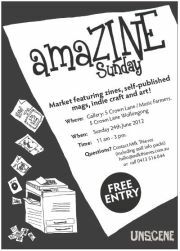 The AmaZINE Sunday event will be on in Wollongong on the 24th June, 2012. It's a market featuring zines, self-published magazines, indie craft and art! It'll be held at the Gallery: 5 Crown Lane, Wollongong. When: 11am - 3pm.